Plants take root in one to three days! Young plants have a shorter period of instability. Plants recover quickly from transplanting. Limits plants from falling over as often seen in commercial greenhouses. No need to pre wash! GrowZorb slabs /micro slabs consists of a continuous matrix of small connected cells. Slabs have no “fines” tannins or loose particulates. There is no need to was.h/rinse anything out. Circulate is ready to use on Day 1. When GrowZorb is “Soaked” with water it will still have a minimum of 60% oxygen content. 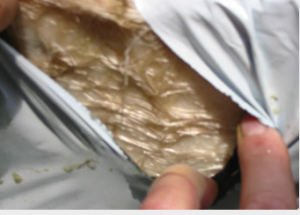 This is due to the adsorbent quality of GrowZorb it simply “sheds” excess water from the cell walls. It is almost impossible to over water when in GrowZorb. 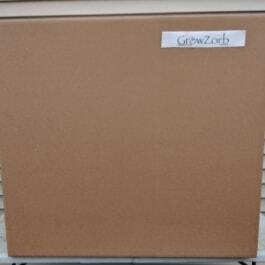 The GrowZorb matrix is an adsorbent as opposed to absorbent. The difference being that an adsorbent creates a film of water on the surface of the adsorbent whereas an absorbent will soak up the water to its very core. Once soaked into the core it is difficult to release leaving less available water while decreasing the oxygen ratio. 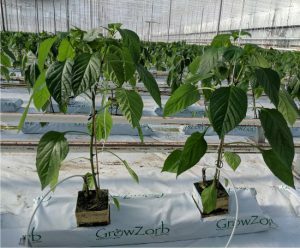 If irrigation is compromised, plants in GrowZorb take longer to wither/flag because 100% of the water is available and ready to use at any time. This is why a GrowZorb slab can withstand an irrigation problem better than the competition, even though it has less water in it to begin with. GrowZorb can be used many times over. The slabs will remain dimensionally stable until they are crushed. Old plants can be cut off and new plants put in is place. Or the used slabs can be ground up and turned into what we call “regrind” It can be disinfected if necessary and used right away or stored for future use. 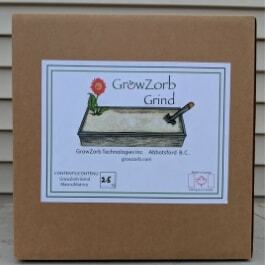 The GrowZorb Grind/regrind can simply be knocked/washed away from the root matrix, it can be disinfected if necessary and used right away or stored for future use. Given that GrowZorb is an adsorbent it is very efficient at a rapid cleanout. It can be used to doctor the medium if necessary. 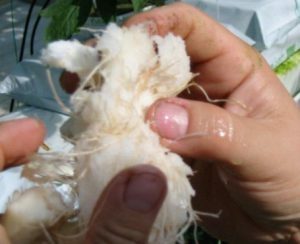 A treatment can be administered and then again flushed out almost faster than the plant will notice. This can also be used to control the root zone temperature without overwatering. As the GrowZorb matrix is an adsorbent the irrigation cycle is easy to alter, it is a “dryer” medium than most as it sheds water rapidly and easily. This also limits the need to predict what the plants will need several hours in advance depending on a change in climate. 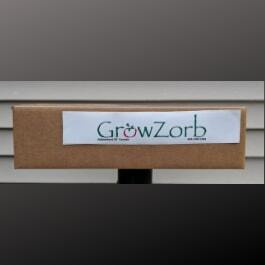 GrowZorb is a manufactured product. It has no chance of picking up bugs along the way and introducing it to your facility. GrowZorb has no food value therefore pests have no interest in it. A healthy plant is bug resistant. GrowZorb will not react with anything, it will not leach or degas. Therefore you are 100% in control of what the plant gets, there is nothing to balance out. Whatever PH you create is what it is. This in combination with its ease to flush makes it very easy to stabilize.